Will our dreams of a white Christmas come true? 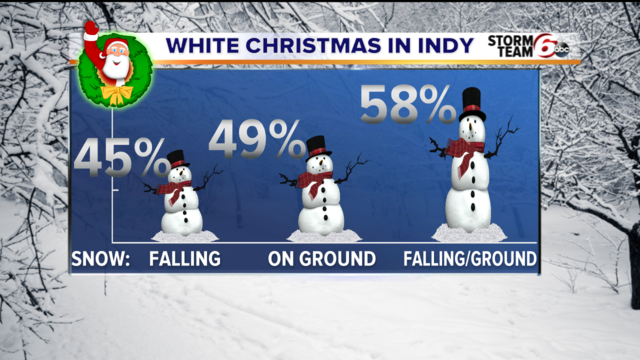 INDIANAPOLIS — Whether you're a fan of snow or not, many at least wish for some snow on Christmas Day. What are our historical chances of a white Christmas? There are various ways of looking at it. Traditionally, a white Christmas is defined as having 1 inch or more of snow on the ground Christmas Day. For the Indianapolis area, that means our chance is only about 26 percent. Those chances increase as you travel north and decrease to the south. If you want to improve your odds a little bit, you can also consider a white Christmas as any amount of snow either falling OR on the ground Christmas Day. When you slice it that way, the chance our snow dreams coming true jumps to about 50 percent! Just last year, we had snow on the ground Christmas Day AND a tenth of an inch of snow also fell on December 25. While the snow in 2017 was just enough to set the festive scene, we have had some more substantial snows for Christmas. 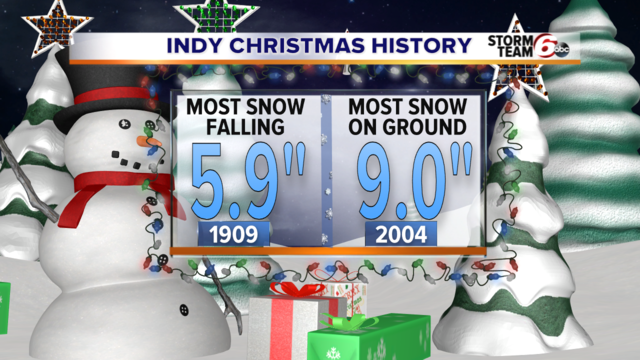 The most snow to fall in Indy on Christmas Day was 5.9 inches in 1909. Of more recent memory, the most snow we've ever had on the ground was 9 inches in 2004. 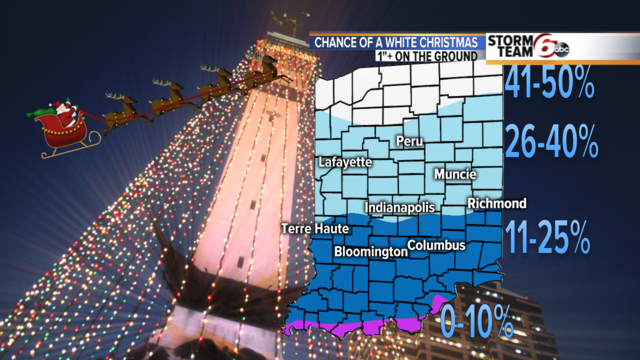 We're still a little too far out to know much about our chances of a white Christmas this year. The trend we can see takes us to just a few days before the holiday. Those models suggest an overall warming trend to above average temperatures, but also for above average precipitation. That doesn't necessarily mean no snow. For now, we'll keep dreaming of a white Christmas in hopes our dreams come true again this year.